Lookin At Lucky was a remarkable juvenile as he became the first horse in America in 22 years to win three Grade 1 races at 2 years, despite being a May 27 foal. He then became the first American colt in 31 years to be an Eclipse Champion at both 2 & 3 years. Lookin At Lucky is one of the very best sons of champion sire Smart Strike and is bred on a similar Mr. Prospector/Danzig cross to the leading sire Distorted Humor. 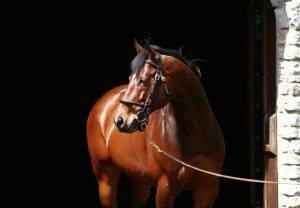 He is now transferring his talent to the role of stallion, with his son Accelerate and daughter Wow Cat being his star performers of 2018. Smart Strike had seven stakes winners, headed by Curlin and Tenpins, from daughters of DEPUTY MINISTER. Remarkably, four of his sons – Lookin At Lucky, Curlin, English Channel and Square Eddie - already have Gr.1 winners from this line, out of daughters of DEPUTY MINISTER, AWESOME AGAIN, SILVER DEPUTY, GRAEME HALL and TEN MOST WANTED. Lookin At Lucky’s top son Accelerate has a dam by AWESOME AGAIN and he also has two talented performers out of DEPUTY MINISTER mares. Judging by the record of the similarly-bred Distorted Humor, Lookin At Lucky will do well with mares from the SEATTLE SLEW line. 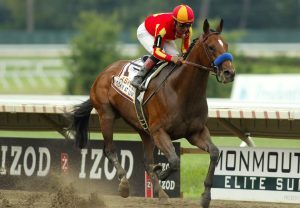 Two of Distorted Humor’s best sons, Funny Cide and Any Given Saturday, are out of grand-daughters of SEATTLE SLEW while Belmont Stakes winner Drosselmeyer has a second dam by SLEW O’GOLD. Curlin’s classic winner Exaggerator has a dam by VINDICATION. Lookin At Lucky has Gr.2 winner Madefromlucky and Gr.3 winner Lookin For Eight from grand-daughters of A.P. INDY, by PULPIT and MINESHAFT. He sired the Gr.1-placed One Lucky Dane from a mare by BOSTON HARBOR and 2018 Gr.3 winner Lookin To Strike has a second dam by Pulpit. Another of Smart Strike’s sons, Curlin, sired the Gr.1 winners Off The Tracks and Stellar Wind from daughters of BOSTON HARBOR and MALIBU MOON, while Smart Strike sired Gr.1 winners from A.P. INDY mares. Distorted Humor’s record suggests that Lookin At Lucky will suit daughters and grand-daughters of SADLER’S WELLS. 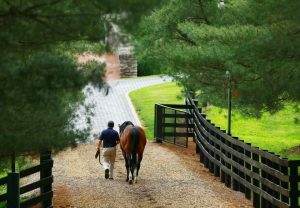 Distorted Humor’s foals out of Sadler’s Wells mares feature three Gr.1 winners and his Travers Stakes winner Flower Alley has a second dam by Sadler’s Wells and another of his Gr.1 winners, Bit of Whimsy, is out of a mare by EL PRADO. Smart Strike has enjoyed Gr.1 success with Sadler’s Wells and English Channel has two Gr.1 winners from this line, so mares by EL PRADO, KITTEN’S JOY and MEDAGLIA D’ORO are ideal for Lookin At Lucky. Lookin At Lucky is by Smart Strike, who sired English Channel from a grand-daughter of NUREYEV. Nureyev also sired the dam of one of Smart Strike’s Gr.2 winners and the second dam of one of his Gr.1 winners. Lookin At Lucky’s Gr.2 winner Dr Dorr is out of a grand-daughter of NUREYEV, by UNUSUAL HEAT. Lookin At Lucky merits serious consideration for mares from the STORM CAT line. 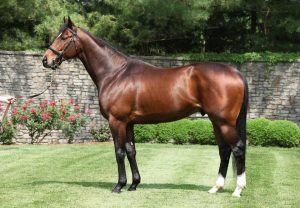 Smart Strike had four Graded stakes winners out of STORM CAT mares, including a Gr.1 winner, and Curlin has a Gr.2 winner with a Storm Cat dam and Gr.3 winners with dams by GIANT’S CAUSEWAY and STORMY ATLANTIC. Lookin At Lucky’s first Graded winner, Lucky Player, has a dam by STORM CAT, and he also sired the Gr.1 winner Wow Cat from a CAT THIEF mare. A GIANT’S CAUSEWAY mare with Lookin At Lucky has already produced the Gr.1-placed Maybellene. Lookin At Lucky’s smart son Giuseppe The Great has a dam by FORESTRY. Smart Strike and English Channel have worked well with mares from the NIJINSKY line and Lookin At Lucky already has a Gr.3 winner out of a SKY CLASSIC mare. 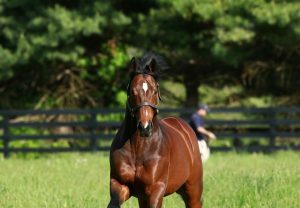 Smart Strike has Graded winners out of daughters of seven different sons of DANZIG, including BOUNDARY, DAYJUR and DANEHILL. Lookin At Lucky’s Gr.1 performer Lookin At Lee is 4x3 to DANZIG as his dam is by a LANGFUHR while Gr.3 winner Lookin For Eight has a third dam by DANZIG. Lookin At Lucky is a grandson of MR PROSPECTOR and it’s worth noting he also works well with this line. Indeed his Gr.2 winner Madefromlucky is out of a mare inbred to MR PROSPECTOR. The FAPPIANO branch appeals most, as one of his Gr.2 winners has a dam by UNBRIDLED’S SONG and another has a second dam by UNBRIDLED.